Yesterday Andy, Gwen, and I drove to College Station for the A&M/Nebraska football game. Kara stayed home because she did not feel well. We took off for the game around 2PM and she took off to see the Doctor. We planned to watch the game and spend the night in a hotel in Groesbeck which is about an hour North of College Station towards Dallas. 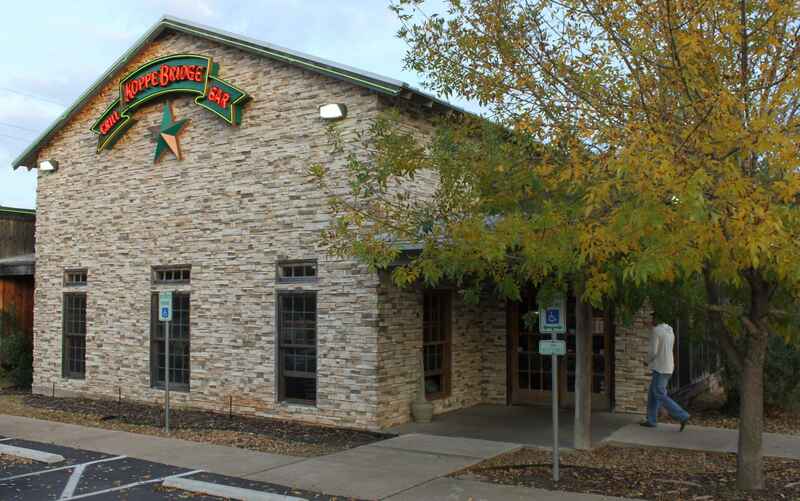 We arrived in College Station after a non-eventful trip at least for me (I took a long nap) and had burgers at the best burger joint in town – Koppe Bridge Grill and Bar). 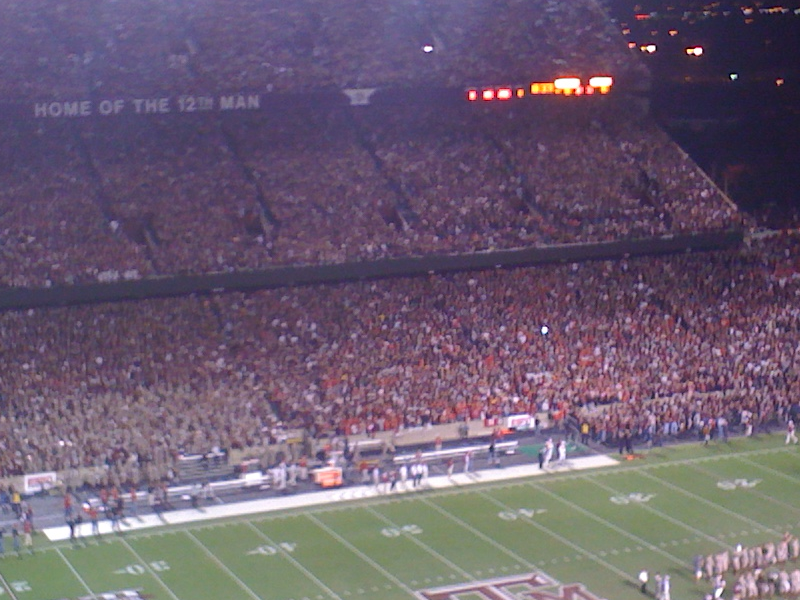 90,000 fans showed up for the game which set a record for Kyle field. If you have never been to an Aggie game you must go sometime. I don’t know why they put seats in the stadium because everyone stands most of the time. It is a combination of the seats are so narrow there is no room to sit anyway and it is apparently an Aggie tradition to stand. The fans also yell constantly. The noise is similar to being in Tornado!! And the noise plays an important part in the story later. Photo is terrible. Shot it with my phone. Do you think I will ever learn and just start taking my camera everywhere? I never have if when I really want to take picture. When the game finally starts at 7 PM it is everything it promised to be. Nebraska starts out with a 7 minute drive mostly on the ground but the Aggie defense stiffened and the Huskers came away with only a field goal. Through much of the 1st quarter we wondered if the Aggies would ever get a 1st down. Finally the Aggie offense started to roll and drove down the field only to be stopped for a field goal also. Half time comes and the Aggie band was awesome. They are another good reason to go see an Aggie game. For years the Aggie football teams were horrible and the highlight of the game was the Aggie band half time performance. Mid-way through the 3rd quarter Andy starts getting text messages from Kara. She is becoming very ill and Averi Grace who is at her other grandfathers for the night vomited 3 times so grandfather is bringing her home because he does not know what to do with her. As I said earlier there are 90K fans in the stadium and they are all yelling so making a phone call is out of reason for two reasons: 1) 90K people are trying to make phone calls, and 2) you could not hear anyway because the sound is like being in the eye of a tornado. Gwen gets in on the texting because Andy cannot get through 1/2 the time. Meanwhile Kara is getting worse. Andy and Gwen have sent text messages to most of DFW to go help Kara and we decide to drive home after the game because the situation at home sounds dire. The game ends. Aggies win 9-6 – 5 field goals were the only scores. We skip the hotel and drive home. I drive. Andy and Gwen watch sports center on his iPad through the slingbox connected to his home tv and tweet his friends and fellow Aggies everything about the game. They also watch a U-Tube video someone has posted of the Nebraska coach’s brother taking out a TV camera man after the game. What is the World coming to. That is another story also…. To top off the weekend the Cowboys won their 2nd straight game by beating the Lions!! What are the first 3 songs that come to mind when you think of your childhood – younger than Junior High? Peter and the Wolf – parents had it on 45s and played it for at least me a lot. I happened to hear a snippet of it a while back and all the memories came flooding back. : East house, funny carpet on the living room floor, taking a bath on Saturday night in the portable tub in the Dining room because we did not get an inside bathroom until I was in 6th grade, the party phone on the wall with a different ring for each of the 13 subscribers, Uncle Julius, the old black 47 Plymouth. I just listened to Peter and the Wolf this afternoon and it is as good as ever. Ghost Riders in the Sky – Laying on the floor of the East house listening to it – Vaughn Monroe I think. Don’t know why I remember this one but it popped into my head. You are my Sunshine – my mother sang it all the time. I don’t know who she was singing about? I remember her singing it while making soap our of pig lard at the East house. You are currently browsing the Number 6's Blog blog archives for November, 2010.